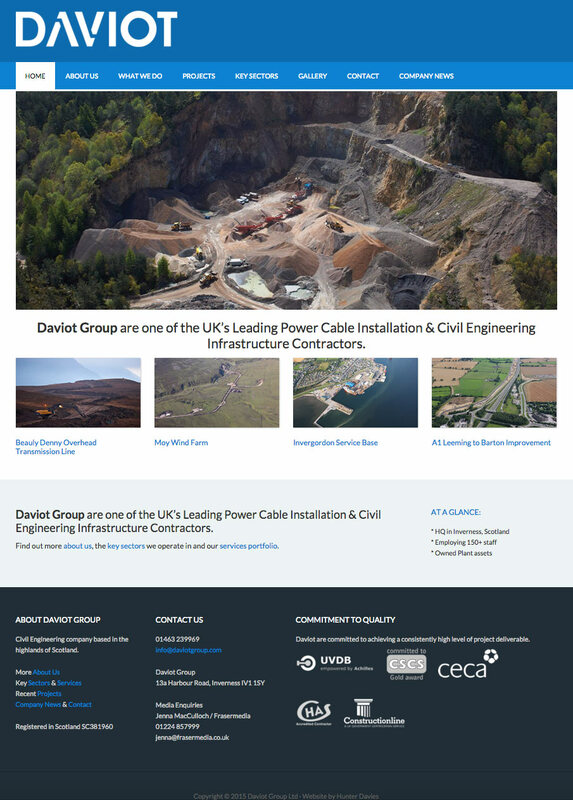 Daviot Group are one of the UK’s Leading Power Cable Installation & Civil Engineering Infrastructure Contractors. With extensive experience in Marine Civils; Renewable Energy Civils Infrastructure and Highways and Transportation Civils Infrastructure. Daviot Group have successfully delivered a diverse range of projects within the Power, Transportation, Renewable Energy and Marine sectors. Daviot Group approached us to help define and implement their brand as well as to design and develop their new website. The website is easy to navigate and clearly explains what the Daviot business is about. With an eye-catching vibrant blue header and a bold block capital logo, Daviot now has a consistent look over many platforms. We included a sliding gallery, allowing website visitors to effortlessly view multiple images of Daviot’s past projects. The company news section allows regular news articles to be posted by Daviot, keeping the reader informed and up to date. Schedule a free consultation with Skye Websites to talk through your business ideas.